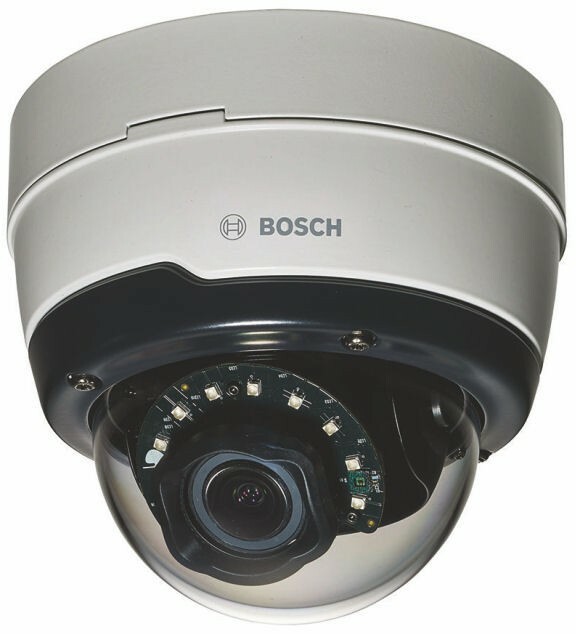 The HD indoor dome cameras from Bosch are professional surveillance cameras that provide high quality HD images for demanding security and surveillance network requirements. These domes are true day/night cameras offering excellent performance day or night. There is a version with a built-in active infrared illuminator that provides high performance in extreme low-light environments. Vandal resistant outdoor dome with varifocal lens Ideal for outdoor use, the IK10-rated design is suitable for installations where a vandal resistance is important. The camera is protected against water and dust to IP66 standards. The varifocal lens allows you to choose the coverage area to best suit your application. Mounting options are numerous, including surface, wall, and suspended-ceiling mounting. bandwidth and storage requirements The camera uses Intelligent Dynamic Noise Reduction which actively analyzes the contents of a scene and reduces noise artifacts accordingly. The low-noise image and the efficient H.264 compression technology provide clear images while reducing bandwidth and storage by up to 50% compared to other H.264 cameras. This results in reduced-bandwidth streams that still retain a high image quality and smooth motion. The camera provides the most usable image possible by cleverly optimizing the detail-to-bandwidth ratio. Area-based encoding is another feature which reduces bandwidth. Compression parameters for up to eight user-definable regions can be set. This allows uninteresting regions to be highly compressed, leaving more bandwidth for important parts of the scene. Regions of Interest (ROI) can be user defined. The remote E-PTZ (Electronic Pan, Tilt and Zoom) controls allow you to select specific areas of the parent image. These regions produce separate streams for remote viewing and recording. These streams, together with the main stream, allow the operator to separately monitor the most interesting part of a scene while still retaining situational awareness. Two-way audio allows the operator to communicate with visitors or intruders via an external audio line input and output. Audio detection can be used to generate an alarm if needed. A wide range of configuration options is available for alarms signaling camera tampering. A built-in algorithm for detecting movement in the video can also be used for alarm signaling. The MicroSD card slot supports up to 2 TB of storage capacity. A microSD card can be used for local alarm recording. Pre-alarm recording in RAM reduces recording bandwidth on the network, or — if microSD card recording is used — extends the effective life of the storage medium. The camera supports time-based or alarm-based JPEG posting to four different accounts. These accounts can address FTP servers or cloud-based storage facilities (for example, Dropbox). Video clips or JPEG images can also be exported to these accounts. Alarms can be set up to trigger an e-mail or SMS notification so you are always aware of abnormal events. Power for the camera can be supplied via a Powerover-Ethernet compliant network cable connection. With this configuration, only a single cable connection is required to view, power, and control the camera. Using PoE makes installation easier and more costeffective, as cameras do not require a local power source. The camera can also be supplied with power from +12 VDC power supplies. For trouble-free network cabling, the camera supports Auto-MDIX which allows the use of straight or crossover cables. The camera incorporates mechanical filter technology for vivid daytime color and exceptional night-time imaging while maintaining sharp focus under all lighting conditions. An analog video output enables the camera to operate in hybrid mode. This mode provides simultaneous high resolution HD video streaming and an analog video output via an SMB connector. The hybrid functionality offers an easy migration path from legacy CCTV to a modern IP-based system. Password protection with three levels and 802.1x authentication is supported. To secure Web browser access, use HTTPS with a SSL certificate stored in the camera. The video and audio communication channels can be independently AES encrypted with 128-bit keys by installing the optional encryption site license. using a web browser, with the Bosch Video Management System, with the free-of-charge Bosch Video Client or Video Security Client, with the video security mobile app, or via third-party software. The Bosch video security mobile App has been developed to enable Anywhere access to HD surveillance images allowing you to view live images from any location. The App is designed to give you complete control of all your cameras, from panning and tilting to zoom and focus functions. It’s like taking your control room with you. This App, together with the separately available Bosch transcoder, will allow you to fully utilize our dynamic transcoding features so you can play back images even over low-bandwidth connections. The camera conforms to the ONVIF Profile S specification. Compliance with this standard guarantees interoperability between network video products regardless of manufacturer. Third-party integrators can easily access the internal feature set of the camera for integration into large projects. Visit the Bosch Integration Partner Program (IPP) website (ipp.boschsecurity.com) for more information.